Correction to: BMC Neurol (2017) 17:58. Following publication of the original article , the authors reported the following errors on their article. 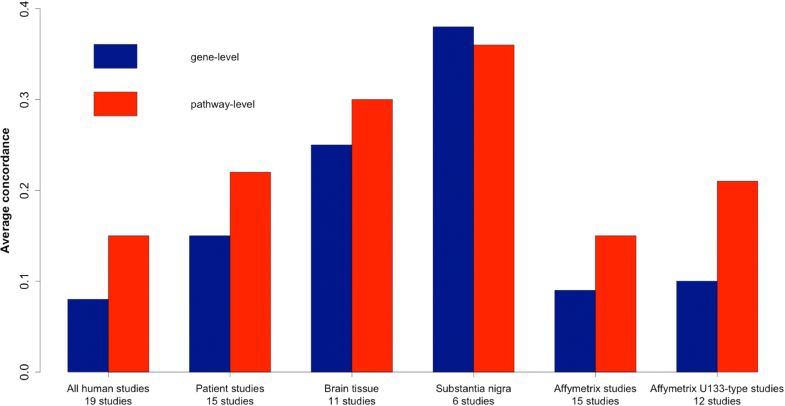 1) In Table 1, the ‘Average concordance of expression signatures’ of the ‘Basal ganglia’ should be 0.11’ instead of 0.10. 2) The rightmost bar in Fig. 2 should be 0.21 instead of 0.29. Below is the correct version of the figure. Oerton E, Bender A. Concordance analysis of microarray studies identifies representative gene expression changes in Parkinson’s disease: a comparison of 33 human and animal studies. BMC Neurol. 2017;17(58). https://doi.org/10.1186/s12883-017-0838-x.